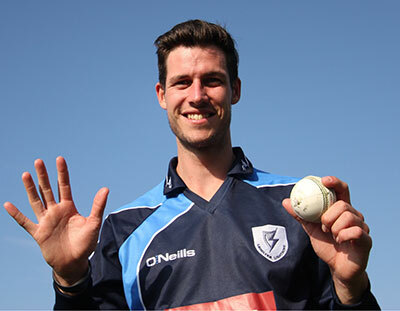 A world record seventh wicket stand of 215 for List-A cricket between Simi Singh and George Dockrell was the highlight of Lightning’s remarkable 53-run win against Northern Knights at Milverton. Early wickets for Graeme McCarter (2-41) and Knights captain Shane Getkate (4-47) had the hosts in total disarray at 62 for 6. They were rescued by a superb partnership between Irish internationals Simi Singh and George Dockrell, who at first consolidated, then exploded in dramatic fashion in the final phase. Singh has reached just 11 from his first 43 balls before dispatching Jacob Mulder twice into the fields to get up and running. He went on to hit an unbeaten 121 from 108 balls, which included 8 fours and 8 sixes – three of them off consecutive Mark Adair deliveries. The Knights will point to what looked a catch behind by Neil Rock from Harry Tector when Singh had just 37 and the total 119 as a crucial turning point. Tector’s anguish at the decision not going in his favour clear for all to see. Singh and Dockrell then really added insult to injury as they went on a barrage blitz thumping the ball to all parts of the sun-drenched Hills ground. 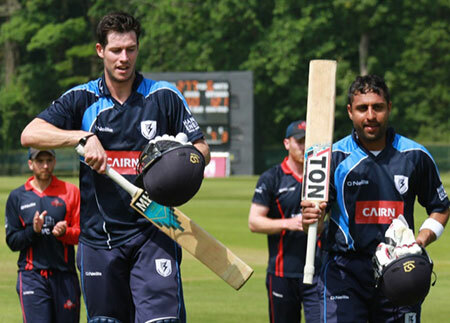 127 runs came in the final nine overs of the innings, with Dockrell just missing out on a deserved century – finishing unbeaten on 98 from 86 balls, with 12 fours and 3 sixes. Their partnership was an interpro 50-over record for any wicket, beating the 202 made by Singh and John Anderson against the Warriors in 2016. Singh’s 121* was the seventh century in the format and the third highest score behind his 136 and Andrew Poynter’s 123. The Lightning total of 277 for 6 was the sixth highest – Lightning now hold six of the top seven totals. Knights to their credit came out with positive intent, but despite being up with the required rate at all stages of their innings kept losing wickets at crucial times. Tyrone Kane (2-53) took out Marc Ellison and James McCollum early, but Nikolai Smith (40) still kept finding the boundaries, striking eight in a breezy cameo before becoming the first of two wickets for Kevin O’Brien (2-21). James Shannon (43) and Shane Getkate (23) once again got the Knights back into contention, before both played shots they will not look back on with any great pride. Both fell to George Dockrell, who went on to dismiss Mark Adair, Graeme McCarter and Jacob Mulder to finish with the excellent analysis of 5 for 21 – the best figures in the six years of the competition. Teenager Neil Rock entertained the crowd as he top-scored with 47 from 42 balls (5 fours, 2 sixes) as he and Gary Kidd shared a last wicket stand of 37 – another record! However, it was that man Dockrell again who had the final say, taking an excellent running catch to dismiss Rock off the bowling of Peter Chase (1-37) as the Knights fell for 224 in the 43rd over. The Knights will surely put this game in ‘the one that got away’ category, while Lightning yet again showed the depth and quality of their squad, underlining why they have won 13 of the 15 trophies on offer over the past five years. It will be no surprise if many of their squad are named in the Ireland team for the T20 internationals next week against The Netherlands and Scotland – that squad is expected to be announced on Tuesday.